The 1958 Philadelphia Phillies finished eighth in the National League, the first of four consecutive last-place finishes. Despite that record, the team was not devoid of achievements. Several players generated solid performances. Center fielder Richie Ashburn led the majors in batting with a .350 average. Left fielder Harry Anderson batted .301, hit 23 home runs, and drove in 95 runs. Robin Roberts won 17 games, fourth highest in the league. In addition, Philadelphia tied a National League team record set just the year before by Cincinnati with 64 pinch hits.1 Two players were key contributors in attaining this record, Dave Philley, who generated a.409 average as a pinch-hitter, and Bob Bowman, narrowly behind Philley at .406. As Bowman recalled, a friend, Gabe Padilla, set to go to spring training with the Klamath Falls Gems of the Class D Far West League in 1950, put in a word for him and Bowman got a tryout as a pitcher. Although Bowman initially made the team, he was subsequently released. Later, when another ballplayer injured his wrist, the Gems’ manager, Hub Kittle, sought out Bowman, who was loading railcars at a junkyard in Klamath Falls. Kittle told Bowman to suit up. Having seen Bowman hit, Kittle decided he had a better chance to make it as an outfielder. “And so I signed to play at $150 a month,” Bowman recalled. He didn’t impress much his first season, hitting just .224 in 67 games.6 However, he showed enough to warrant being invited back the next season. He was still learning the game. Years later, Bowman described how he had to learn to throw differently from the outfield than he had when on the mound. “Now I was up against it. I had to learn how to chase fly balls and how to make the throw from the outfield. My arm was strong enough, but I had a pitcher’s wrist action. I had to learn how to throw directly over-arm and get that backspin on the ball that makes it “take off” when it hits the ground and go faster toward the target.”7 Bowman’s efforts to throw correctly were successful. When he made the major leagues, his arm was considered one of the best in the National League. His throwing ability drew attention his entire professional career. Bowman showed marked improvement in his second season with Klamath Falls. He was hitting.300 after 59 games with a.470 slugging average when he was transferred up the ladder in the Phillies organization to the Salt Lake City Bees in the Class C Pioneer League. There he batted.270 with 9 home runs in 71 games. After the season ended, on October 7, 1951, Bowman married Joyce Call, whom he had met in high school. She had asked him to the Sadie Hawkins Dance, and from that point on things progressed. Eventually she obtained a degree in journalism from San Jose State. Over the years, she would write brief articles for local papers on her experiences as the wife of a professional ballplayer. She strongly encouraged and supported her husband’s professional career while maintaining that family life could be particularly demanding. The Bowmans had three children, Bradley, Sheridan, and Jacqueline. Joyce died of lung cancer in 2004. In 1952 Bowman earned promotion to the Wilmington Blue Rocks in the Class B Interstate League. There he did well until a beaning took him out of the lineup. “A fastball caught me in the temple,” he related, “I had 18 homers and was batting over .300 at the time. When I got back in the lineup, I hit only one more homer and wound up at .260.” (.258). It took me quite a while to get over being nervous at the plate.”8 Despite this setback, he advanced to the Schenectady Blue Jays in the Class A Eastern League. While Bowman’s performances were never spectacular enough to put him on the fast track toward the majors, he progressed steadily. In 1954, after looking him over in spring training, the Phillies advanced him to the Syracuse Chiefs of the Triple-A International League. Bowman found the competition daunting. The Phillies usually finished in the first division during his minor-league years. Part of the reason they fared well was an exceptional outfield, manned by future Hall of Famer Ashburn in center and left fielder Del Ennis, whose power enabled him to generate six 100-plus-RBI seasons with the Phillies. Johnny Wyrostek, Jim Greengrass, Rip Repulski, and Wally Post, occupying right field, gave Bowman stiff competition. He always felt he labored under a burden; others signed to considerable bonuses received greater consideration, given the club’s investment in them. Bowman did well for Syracuse in 1954 and 1955, well enough to start the 1955 season in the majors, appearing in three games as a temporary replacement for the injured Richie Ashburn. Bowman’s first major-league game came on April 16, 1955, at the Polo Grounds in New York against the Giants, when he ran for Ashburn in the ninth inning. Eight days later, on April 24, he started against the Pittsburgh Pirates, going 0-for-3. His first at-bat was a groundout against starter Nellie King. In 1956 Philadelphia switched its Triple-A affiliation from Syracuse to the Miami Marlins. The team included future Phillies Ed Bouchee, Don Cardwell, Turk Farrell, and Jim Owens, as well as Satchel Paige. Bowman recalled the then allegedly 49-year-old Paige as taking a lot of good-natured ribbing from teammates half his age (Bowman was 25). Paige still had tremendous control. The outfield fence had a small hole in it, and players hitting a ball through the hole would win a gift. Paige, standing the pitching distance away, routinely threw the ball through the hole. While on the team for his marquee value, Paige could still pitch. He most often started the seven-inning second games of doubleheaders, going 11-4 with a 1.86 ERA. Bowman emerged as the hitting star for Miami, leading the league in home runs and runs batted in until he hurt a rib trying to break up a double play.9 He missed 20 games and lost his stroke until the last few weeks of the season, when he came back strong to finish his best season with 19 home runs, 79 RBIs, and a .490 slugging average. In a late-season call-up to the Phillies, Bowman played in six games and went 3-for-16. His first major-league hit was a solo home run off Johnny Antonelli, the Giants ace, at the Polo Grounds. His second was an RBI triple. Bowman was off to a fast start at the plate as well, hitting over .300 until he slumped in late May and was replaced by Repulski. For the rest of the season, Bowman pinch-hit and made occasional starts in right field. His hitting problems continued through the end of August, when his batting average reached a season low .233. Then he hit .484 the rest of the season and ended at .266, having shown power and an ability to get on base (.352 on-base percentage), better than anyone on the team except Ashburn and Bouchee. After briefly holding first place in mid-July, Philadelphia fell to fifth. Besides injuries, Bowman felt other factors contributed to the team’s slump, including off-field distractions that affected the play of the younger regulars. Bowman’s was hardly a lone opinion. Bouchee in We Played the Game, alluded to off-field adventures that could only have been detrimental to their play. Bowman’s main concern was to make the club again in 1958. Once again, he faced stiff competition. Bowman would not only have to compete with Repulski for right field but also against slugger Wally Post, obtained from Cincinnati. Against this competition, Bowman served as a backup outfielder. While Bowman picked up an occasional start, he mostly pinch-hit. Quite often his hits came in losing efforts for a team that fell into the cellar for good at the end of August. It was not for want of pinch-hitting efforts, though. Bowman, Philley, Post, and Repulski did well, combining for a team pinch-hitting average of .311 with 11 home runs, one short of the major-league record. Bowman hit three pinch home runs, including a game-tying three-run shot off the Milwaukee Braves’ Juan Pizzaro on August 8. Two weeks earlier, his solo homer off the Giants’ Mike McCormick had provided an insurance run in Ray Semproch’s 2-0 shutout. At season’s end, Bowman was acclaimed the major leagues’ top pinch-hitter at .406 (13-for-32).14 (Philley, who ended the season in a rush with a record-setting eight straight pinch hits, hit .400 in the pinch-hitting role.15) Bowman’s batting average in 91 games was .288 with 21 extra-base hits giving him a .500 slugging average. He had done well in several spot starts, going 4-for-4 against the Dodgers on June 19 in an infrequent Phils win. Getting starts in a doubleheader against the Cardinals on June 29, he homered in both games. On July 3 Bowman went 3-for-3 against the first-place Braves, his second-inning double setting up a game-winning rally. Despite the team’s pinch-hitting abilities, Ashburn’s league-leading .350, and Harry Anderson’s .301 with 23 home runs, Philadelphia finished last. This dubious achievement had an odd twist. At 23 games out, the Phils finished closer to first than any other team in an eight-team league except the 1915 Giants, who finished 21 games behind the pennant-winning Phillies.16 Poor pitching proved their nemesis. Bowman suggested that by then the “Whiz Kid” championship team of 1950 was past its prime and adequate replacements were not there. Unlike many pinch-hitters, Bowman did not approach his role with any special perspective. It was part of his job, part of the team effort. But that he was regarded as mainly a pinch-hitter was not easily accepted. 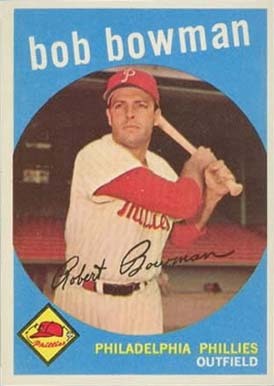 In an article she wrote after the 1958 season, his wife, Joyce, said of Bob, “He doesn’t care if he never pinch-hits again – he wants to be a regular.”17 That the life of a major leaguer was different in the 1950s showed in Bowman’s offseason activities. He worked as a sales clerk in a men’s clothing store in the Philadelphia area.18 Costs attendant to travelling and maintaining an extra residence often exceeded a player’s salary. Bowman said his highest baseball salary was $13,500. Commentary on the Phillies after the 1958 season consistently referred to Bowman’s pinch-hitting abilities and his status as a solid outfielder. There was room for optimism about the Phils as well. Despite having finished eighth, they were a mere three games out of fifth place, just seven out of the first division. During the winter, Bowman played in Caracas, Venezuela. While there, he banged into a wall in the outfield and injured his knee. The injury bothered him the rest of his career and was certainly a factor in his subpar 1959 performance.19 That season proved disastrous. Ashburn dropped a whopping 84 points to .266, Anderson 61 points to a powerless .240, stalwart pitcher Curt Simmons was lost for most of the season to injuries, and trades, bringing the likes of second baseman Sparky Anderson (.218) and catcher Valmy Thomas (.200), disappointed. Unable to get untracked after losing nine straight in May, the Phillies dropped into the cellar in early June never to emerge, ending the season with five fewer victories than they had in 1958. If 1959 was a debacle for the team, it proved fatal to Bowman’s major-league career. After a slow start, he never climbed above .263, and a 1-for-24 skein in late May severely diminished his playing time. Despite his poor performance (.127 in 79 at-bats), Bowman ended the season (and his major-league career) with a bit of flair. In early August, to help save the staff, Bowman pitched in an exhibition game against the Washington Senators. He gave up one run in three innings and struck out four. Bowman’s performance gave Phillies manager Eddie Sawyer cause for thought. He possessed one of the strongest arms in the game, he had begun his professional career as a pitcher and the Phillies needed help on the mound. So on August 28, with Philadelphia down 8-0, Sawyer brought Bowman in to pitch against Pittsburgh. His beginning was inauspicious as Smoky Burgess, the first batter he faced, homered. Bowman did not give up another hit. By the end of the season, Bowman had pitched in five games. His record was 0-1 with a 6.00 ERA, his performance marred by a poor outing in San Francisco, where he gave up three runs in one-third of an inning. For his career, Bowman batted .249 in 256 games with 17 home runs. His slugging average of .403 indicated flashes of power. Throughout his stay with Philadelphia, Bowman’s ability to get into and stay in the lineup was under constant challenge by players who had shown high levels of potential, such as Post and Repulski. Asked what happened in 1959 after some success in 1958, Bowman said his knee injury in Venezuela impeded his play. Bowman’s appearance on the mound for five games represented a record of sorts: the most times a position player appeared on the mound in 1959. Asked if, after not having pitched for years, his appearance on the mound presented any problems, Bowman said it “seemed natural on the mound,” and said he thought he could do it, reflecting the mindset of a professional athlete. By the end of the 1961 season, Bowman was 31 years old. He and Joyce had son Bradley, and Sheridan was on the way. It was time to get out of the game. Almost simultaneously with that realization, a chance discussion with another expectant father while Bowman was at the hospital for the birth of Sheridan led to a job with Joseph George Distributors, a liquor distributor in the San Jose area. That discussion led to a three-decade career with the company. Bowman enjoyed the job, his career in baseball an opening to prospective customers. After the company closed in the early 1990s, Bowman worked a few jobs for several years before retiring in 1996. He and Joyce retired to Lake Almanor in Northern California, where he built a cabin, fished, and enjoyed his grandchildren. His grandson Ryan attested to Bowman’s acumen as a fisherman, noting that if you did what he said, catches would be plentiful. When Joyce died in 2004, Bowman’s children, all residents of the San Francisco Bay area, urged him to move close to them. He moved to a retirement community in the San Jose area. A nearby golf course kept him active. Asked for his impressions of those he played with or against, Bowman offered several observations. Willie Mays was the best player Bowman ever saw; he not only could do everything, he enjoyed playing the game. Sandy Koufax, although still not having reached his prime, was the most formidable pitcher Bowman faced. His fastball and curve were devastating. The record bears it out, Bowman going 1-for-8 against Koufax, striking out five times. (the one hit was a pinch two-run homer in 1958 when Bowman was enjoying his run as a pinch-hitter par excellence. Warren Spahn also rated high; his pinpoint control and assortment of pitches kept a batter guessing. Though his children, as lifelong Bay Area residents, rooted for the Giants. Bowman remained loyal to the Phillies. In 2010 the two teams met in the League Championship Series. Brad invited his dad, then 80, to Game Four. During the game the scoreboard flashed, “Welcome Bob Bowman, Ex-Phillies Outfielder,” Sheridan having arranged for it to happen. Bowman’s response was typical. “Fifty thousand people are sitting here wondering, ‘Who the heck is Bob Bowman?’ ” Most fans would not know. However, the name on the scoreboard identified a player whose career came when with only 16 major-league teams, competition to make the majors was fierce. Bowman made it and stayed several years – not many can say that. He died at age 86 on January 27, 2017. 1 The source for this information is Retrosheet. This record is admittedly short of complete knowledge on the subject, as pinch-hitting records in Retrosheet first appear for 1911. That said, the practice of pinch-hitting was not as prolific as was the case beginning in the 1940s and 1950s, when teams often sent pinch-hitters to the plate 200 or more times in a season. Using this same measure of analysis, the New York Yankees amassed a then major-league record 66 pinch hits in 1954. 2 Interview with Sheridan Bowman on March 11, 2014, and subsequent emails, as well as interviews with Bob Bowman on February 4 and April 4, 2014. Ms. Bowman provided extensive knowledge of the Bowman family history. 3 “Another Indian Depredation – Heroic Conduct of Mrs. Bowman,” Humboldt Times, April 3, 1869. A blog site, ernielb.blogspot.com/2009/03/ghost-dance.html, contains information on the Indian attack. 5 Articles in Bowman’s Hall of Fame file, no dates. 6 All statistics in this article are from Baseball-Reference or Retrosheet. 7 Frank Yeutter, “Bowman Was a Mess at the Plate, He Says; Gives Moses Credit for Finding the Flaws,” Philadelphia Sunday Bulletin, April 21, 1957, H3. 9 “Bob Bowman Adds Confidence to his Power, Arm and Speed,” The Sporting News, April 10, 1957, 32. 10 “Bob Bowman Adds Confidence.”. 11 Bowman interview, April 4, 2014. 12 “From the Ruhl Book,” The Sporting News, June 19, 1957, 16. 13 Bowman scrapbook; “Bob Bowman Club Organized,” The Sporting News, May 22, 1957, 25. 14 “Bowman With .406, Zernial at .395 Top Pinch-Hitters,” The Sporting News, October 29, 1958, 17. 15 Subsequently Philley’s average was adjusted upward to .409, three points above Bowman. The change probably hinged on Philley’s appearance in a game against the Dodgers on June 17. Philley entered the game in the seventh and singled. The Phillies batted around and Philley came up to bat a second time. Later interpretation of how pinch-hitting occurrences are measured led Philley’s second at-bat not to be counted as a pinch-hitting appearance. Sincere thanks to Dave Smith for patiently explaining the intricacy of this statistical fact. 16 In 1959 the Phils would go one game better, finishing 22 games behind the Dodgers and Braves. The Dodgers’ two straight wins against the Braves in the resultant playoff placed the Phillies 23 games back. 17 Undated, untitled article written by Joyce Bowman. In Bowman’s scrapbook. 18 “Phillies Future Takes on Rosy Tint With 4 New Tutor-Coaches,” The Sporting News, October 29, 1958, 20. 19 Bowman interview, April 4, 2014. 20 “Phils Assign 2 to Buffalo,” New York Times, November 30, 1959, 37. 21 Bowman interview, April 4, 2014. 22 Bowman interview, April 4, 2014.